Gold dipped below the $1280 level in the early NA session after Wall Street rebounded strongly to make it difficult for safe-havens to grab investors' attention. However, with the market sentiment turning bitter in the last few hours and the greenback weakening against its major rivals, the yellow metal staged a modest recovery to try to end the day unchanged but eventually failed but managed to close above the $1280 level. On the other hand, concerns over the US - China trade conflict and the cautious tone regarding the global economic outlook in Davos seem to be keeping the yellow metal well supported. As expected, the flag presented on the chart turned out to be valid as the price bounced up after having received support from the lower band. However, the price was having a little struggle to rest above the $1282.2 support level but eventually managed to do so as it is now hovering just above it. 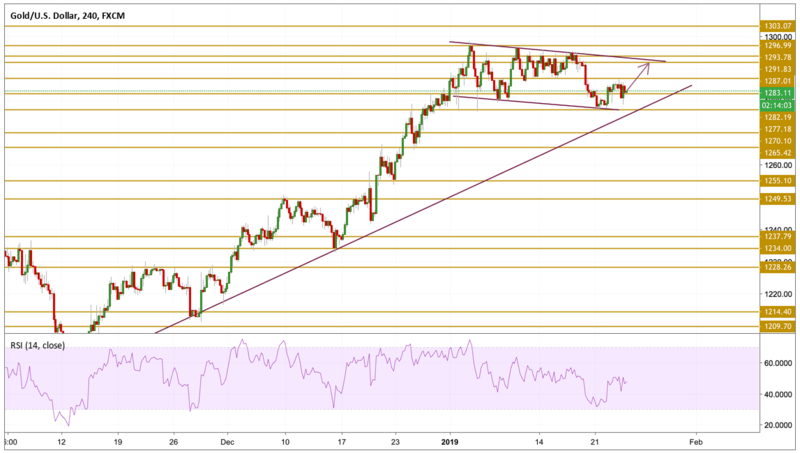 The RSI is pointing towards a relatively bullish momentum and the price seems to be more likely to bounce back up from that stage as we will be watching the $1287 level and eventually the $1291.8 level which coincides with the upper band of the flag.